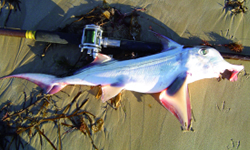 In 2006-07 over $760,000 has been allocated to 17 projects to improve recreational fishing in Victoria. Matching funding of successful projects under Round 4 and Round 5 (to be announced) of the Commonwealth Government's Recreational Fishing Community Grants Programme. The following is a summary of RFGP projects funded from 2006-07 RFL revenue. Unless otherwise stated, these projects are listed under the Department of Economic Development, Jobs, Transport and Resources (former) Department of Primary Industries region from which the project application emanated. $81,000 for a study to evaluate the effects of recreational fishers targeting breeding elephant fish in Western Port (M). Read the evaluation report on effect on elephant fish. $63,000 to implement the fishery and habitat research components of the Mallacoota Inlet Fisheries Management Plan (E). Read the recreational fishery monitoring and fish habitat research report. $33,000 for the implementation of integrated approaches and the monitoring and assessment of recreational estuarine fisheries for Anderson Inlet, Mallacoota Inlet, Glenelg River and Hopkins Rivers (E). Read the Angler diary monitoring of recreational target fish stocks research report. In round 4, five projects to the value of $146,023 (GST-inclusive) were funded by RFL revenue. Construction of a fishing platform, suitable for persons of all abilities, on the Campaspe River, Echuca. In round 5, ten projects to the value of $429,828 (GST-inclusive) were funded by RFL revenue. Goulburn-Eildon recreational fishing precinct: access improvements & habitat enhancement program. East Gippsland fish habitat improvement project - habitat improvements through provision of 16 instream structures and a community awareness program (through local media). Construction of two floating pontoons at Eildon Pondage that rise and fall with the changing water levels. 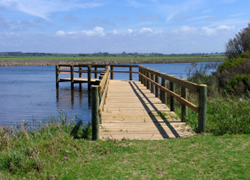 Construction of a fishing platform, shelter and access paths at Nelson River to provide accessible opportunities for people with disabilities or mobility issues. Purchase and installation of nine webcams at locations including: Limeburners, Clifton Springs, Ocean Grove, St Leonard's, Stony Point, Altona, Sorrento, Torquay, Apollo Bay. Trial two fish aggregation devices (FADs) in Victorian waters (proposed locations including Mt Martha and Kannanook Creek). Solar lighting along Franklin River.